WHEN Severnlea wine maker Bruce Humphery-Smith makes a batch of mead, he does not know what he'll end up with. But that is why he likes it - it's always a challenge. Mr Humphery-Smith is one of about 80 mead producers from Australia and had his product for sale with taste testing at Brisbane's Ekka. The honey he uses for the mead comes from Gladstone and Gympie. Every year, the honey he receives is different; it depended on the flowers bees used and the weather. "Each year, each batch is a mystery bag," he said. To show just how vastly different it could be, he pointed to the cabinet of this year's mead entries at the Ekka - each bottle was a different colour, ranging from pale and almost clear yellow to a dark golden honey colour. When Mr Humphery-Smith makes it, he looks for sweetness and the smell. To make the mead, he warms the honey in a warming room for two to three weeks, allows it to ferment and settle and then filters it. 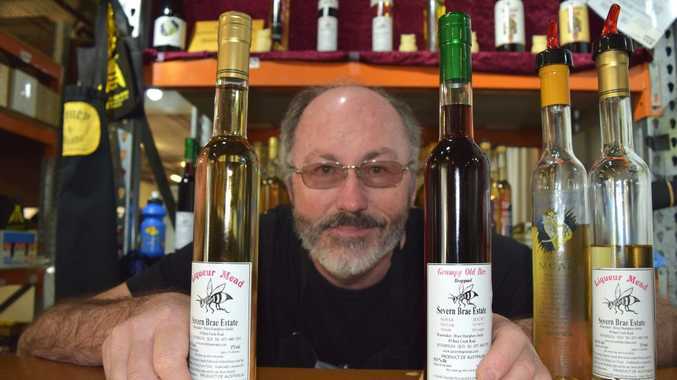 Mr Humphery-Smith, from Severn Brae Estate, said he made mead and melomel, which is a combination of fruit wine and mead. Mr Humphery-Smith hasn't always made mead and wine. He said he had always liked wine and after working in restaurants and the hospitality industry, he started a wine making course in the 1980s and made his first mead in 1990.